We created WP Marketing Engine because we were like most small businesses – tired of the short end of the stick, bandaid solutions, and bad advice. WP Marketing Engine is the tool your business needs to rev up your marketing and get results. All without leaving WordPress. Create your call-to-action with lead capture forms. Watch your lead go straight into your centralized lead database. See everything that a lead has done. Understand the characteristics of your leads and develop campaigns that hit the mark. It all starts here with an easy to use popup form builder. 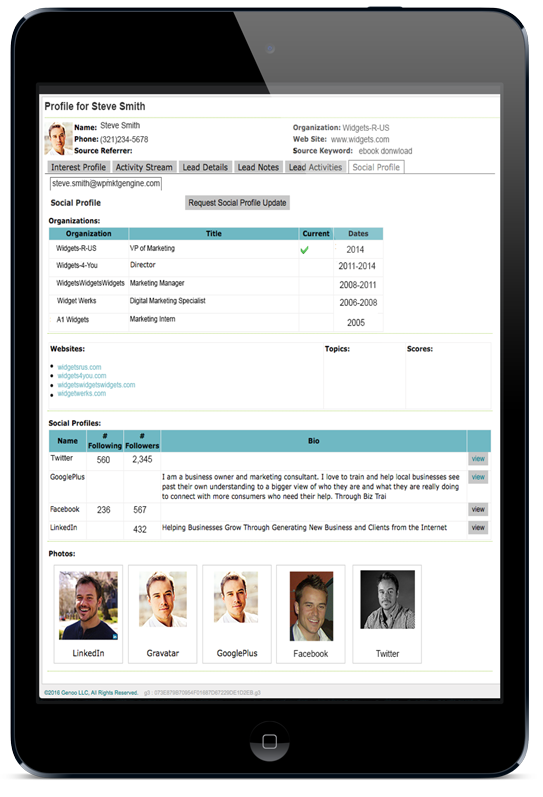 Easily create smart rules triggered by lead activity. Segment leads based on their behavior. Choose the action that suits your strategy. Personalize followup that speaks to each lead’s interest. Select from beautiful responsive templates. Customize to fit your brand. Select your recipients (or let Smart Rules do it for you). 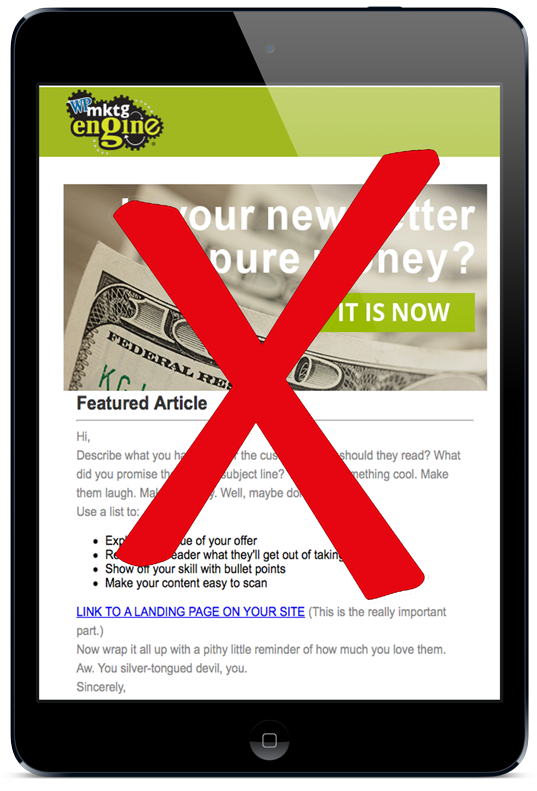 Understand what your emails really cause with “Beyond the Click” metrics. Take immediate action on unexpected awesome results. 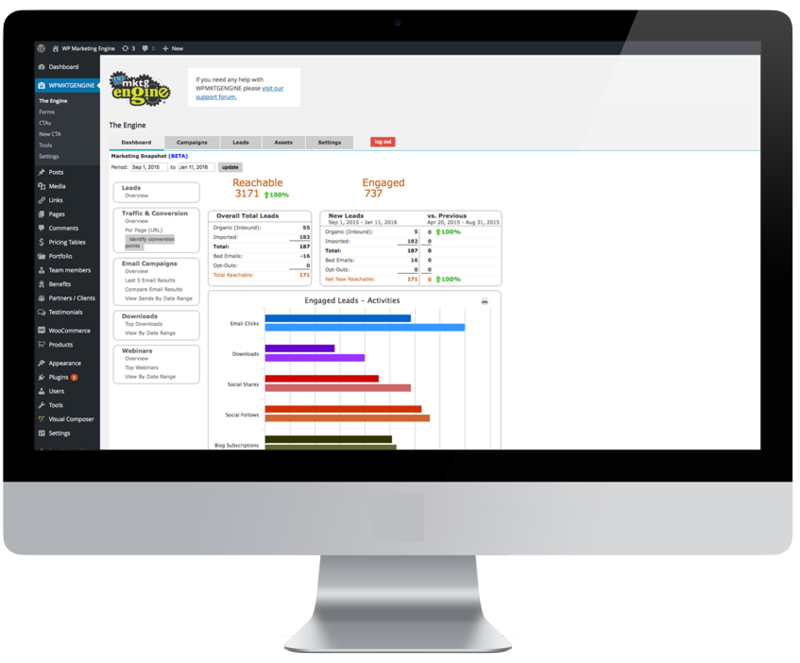 Managing Leads & Campaigns Has Never Been Easier! 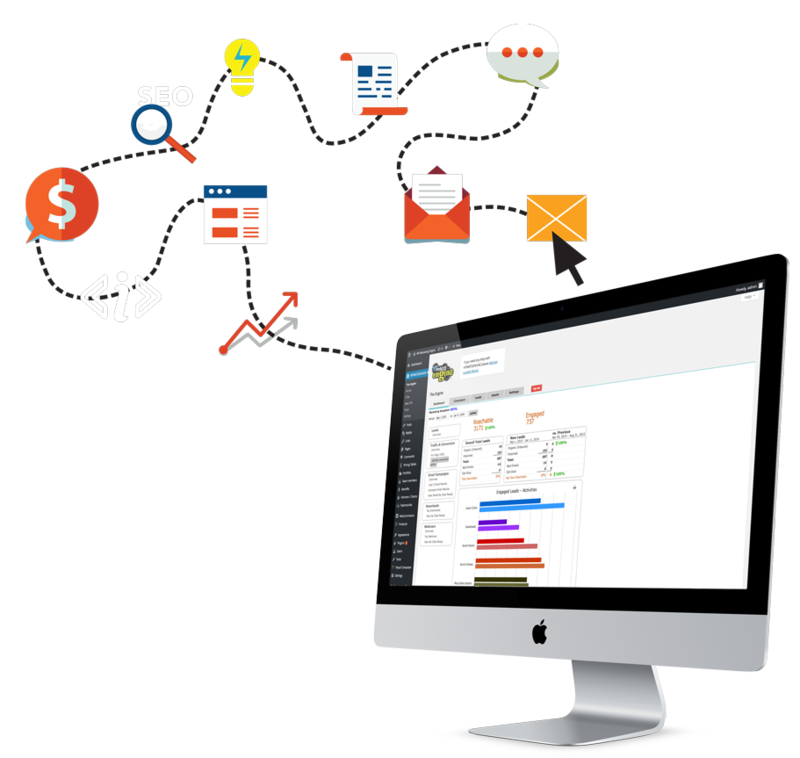 WP Marketing Engine is the first complete marketing automation WordPress plugin that allows you to manage and track your leads without leaving your WordPress admin. Forget about cobbling together multiple tools and plugins, or syncing data from tool to tool. We know you use many different plugins and point solutions to address specific requirements and needs. That’s fine with us! WP Marketing Engine is integrated with a host of great plugins and other solutions to give you a full marketing engine, allowing you to run the campaigns and get the results you’re after (and deserve!) – and have all your lead intelligence stored in one place. Don’t see the integration you need below? Let’s have a conversation! Yes! I want a marketing engine for my business! WP Marketing Engine includes everything you need to get started and get productive quickly: a full getting started training series, community forums, and support. Advanced marketing training and priority support are also available to keep your marketing engine at peak performance. Get the complete picture with Social Augmentation. Using only an email address, WP Marketing Engine will search the web for leads’ social profiles and add the information right into their records in your WP Marketing Engine centralized lead database. Think about it, when people express interest in your blog, website, or product by giving you their email address, you can learn more about them (their name, organization, website, and social profiles) to help you target them with exact, relevant messaging. How powerful is that?! Understand every action your leads take – every page they view, every download, every registration, and every email they open – all in once place. If that’s not enough, our “Beyond the Click” email metrics allow you to clearly see what behaviors and actions every email causes. Drill down into your results from your email metrics screen all the way to a list of leads who took a particular action, trigger them into something new, or know what your next email needs to be about. Metrics are not magic – but leveraging them can feel like magic, and it never gets old. 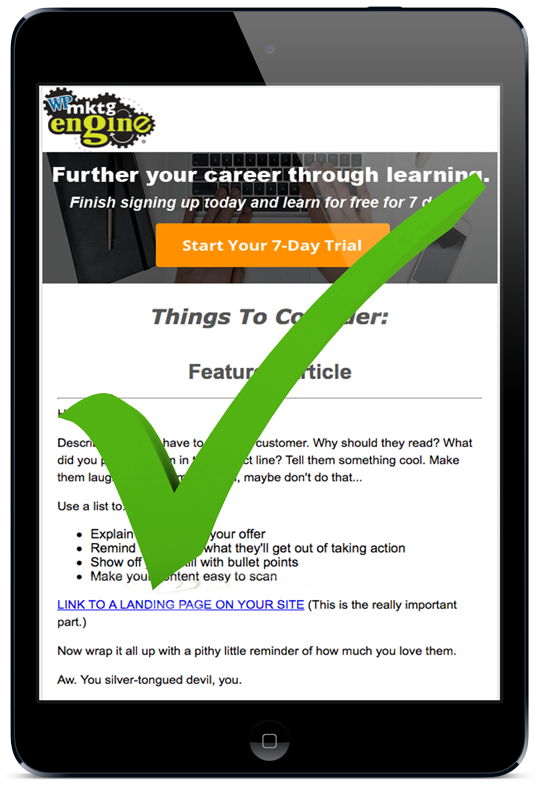 How leads opt-in and how you deepen their engagement, and turn them into customers.